Then… look in the mirror and you will see the pale face and glowing eyes of Bloody Mary staring back at you. Back when I was a kid that’s what two friends dared me to do when we were bored one summer afternoon. It was too hot to go out and do something and we had resorted to a truth or dare kind of game to pass the time. I’d never heard of the Bloody Mary game before and was intrigued but a little creeped out, would Bloody Mary really appear in the mirror if I did all that stuff? ‘Okay, I’ll do it.’ I said after giving it a little bit of thought. So I took a candle and headed towards the only room in that house that could get pitch black, the bathroom. To my surprise one of the two girls that had dared me to play the Bloody Mary game was now saying ‘Nooo don’t’ and trying to stop me from going. The other girl just kind of hung back and was quiet, she too was scared but didn’t want to say anything. Ah, they didn’t think I would actually do it when they dared me. Or maybe it just didn’t hit them what could actually happen until I had accepted the dare. Well one thing was for sure, I couldn’t back out now. I went into the bathroom and closed the door behind me, making sure not to accidentally put out the candle as I set it on the sink. I could hear the girls loudly scampering back to the bedroom and then it was dead quiet. LOL, they really were scared. But maybe they had good reason to be. I did as instructed and turned around three times while chanting the words Bloody Mary. After the third turn I cautiously looked at the mirror, would there be some spin-induced optical illusion that would catch my eye and scare the crap out of me? Or the face of Bloody Mary? Or worse, the face of Bloody Mary hovering right behind me and looking over my shoulder. And… there was nothing. Just the flickering of the candle showing everything that was supposed to be in the bathroom and not a single thing (or person) more. My friends weren’t disappointed as much as relieved that nothing had happened and quickly moved on to other subjects to occupy our afternoon, they never brought up anything like Bloody Mary again. The fact remains though that some people do say they see strange things and even Bloody Mary herself when they play the game. There are many different rituals on how to conjure her in the mirror, often including doing things like whispering ‘I stole your baby Bloody Mary’ three times or for the truly brave out there, firmly locking the door before starting the chant. But who is Bloody Mary anyway and did she ever really exist? And what is the story behind the freaky chant about the baby? 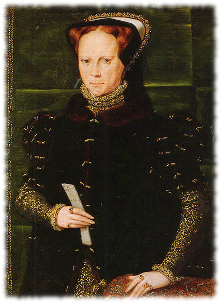 I looked it up and there are various theories as to who the woman behind the Bloody Mary legend is, but many believe her to be a woman named Mary Tudor. 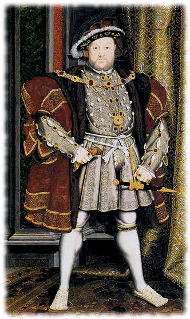 Mary Tudor was the daughter of the notorious King Henry the VIII who is famous for putting his wives to death whenever he grew tired of them. Mary was the daughter of his first wife and so ended up seeing an awful lot of carnage over the years as King Henry VIII put to death not only his wives but a great many of the people around him. To make things worse, for years she was disowned by her father and made to do things like serve in the household of her younger half-sister as a reminder of her new status as an illegitimate child. She grew up in the looming shadow of her unpredictable father, he was the most powerful man in England and could make her life miserable or put it in danger at any moment. 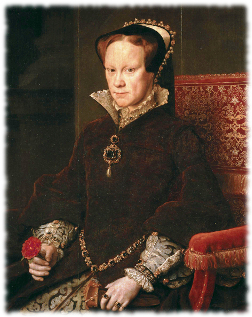 When Mary Tudor became Queen of England at the age of 37 she finally had a chance to do things her way, but unfortunately her way turned out to be things like burning people at the stake because they refused to follow the same religion as hers. Soon large portions of the population started to detest her and her unyielding ways, leading to riots and rebellions around the country and eventually a new name for her: Bloody Mary. And then there was the problem of the baby. Or… what was supposed to be a baby anyways. It was really important that Mary have a child so that she could have an heir to the throne and there was a lot of pressure on her to get pregnant. So you can imagine how overjoyed she was when she suddenly stopped having her periods, gained weight, and got sick in the mornings like most women who are pregnant. As time went on her belly grew and nine months later the entire country prepared for the new heir to the throne to be born. Day after day went by and Mary did not have a baby, yet she still had all the signs of being pregnant. Rumors flew around England, first that she had actually delivered a son, and then later that she wasn’t actually pregnant at all. Eventually after several months of this crazy situation Mary’s stomach shrank and her symptoms disappeared, it turned out that her baby was nothing but a ghost. She was devastated and humiliated, later she had another false pregnancy and died not too long afterwards. After her death people started to add to the story of her life and these stories contributed to what became the legend of Bloody Mary. The stories (often told by those who despised her) included outrageous and frightening things like how she bathed in the blood of young girls to try and stay young. Some stories portrayed her as a vain woman who was always obsessed with her reflection in the mirror and that her soul gets trapped in mirrors, meaning she’s always looking for a way to get out. So… wow right? That’s a pretty intense life story that she had, tragic and scary because it really happened. 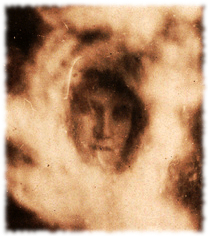 Personally, if I thought that the ghost of Bloody Mary was lingering inside a mirror I wouldn’t taunt her by saying ‘I stole your baby Bloody Mary’, but that’s just me. Maybe you’re braver than I am, but if you do play the Bloody Mary game and see a new face appear in the mirror then at least now you’ll know whose eyes are looking back at you. And…run.